I’ll venture to say that most people (including me, as attested by the fact that Les Misérables has been sitting in my bookcase untouched for quite a while) hesitate to read big, serious, excellent books, even when we know that reading them will benefit us, because of their intimidating size and because we know that reading them will require lots of time. But in passing on these books – many of which are rightly considered classics and have shaped the thinking of people we admire as well as history itself – we’re depriving ourselves not only of practical, intellectual, and spiritual benefits but also great enjoyment. As a way to encourage you (slow readers in particular, take heart!) to tackle more of these kinds of books, here’s some practical advice from John Piper, which he gives in my favorite book of his, When I Don’t Desire God: How to Fight for Joy (Crossway, 2004). “Suppose you read slowly like I do – maybe about the same speed that you speak – 200 words a minute. If you read fifteen minutes a day for one year (say just before supper, or just before bed), you will read 5,474 minutes in the year. Multiply that by 200 words a minute, and you get 1,095,000 words that you would read in a year. Now an average serious book might have about 360 words per page. So you would have read 3,041 pages in one year. That’s ten very substantial books. All in fifteen minutes a day. “Or, to be specific, my copy of [John] Calvin’s Institutes has 1,521 pages in two volumes, with an average of 400 words per page, which is 608,400 words. That means that even if you took a day off each week, you could read this great biblical vision of God and man in less than nine months (about thirty-three weeks) at fifteen minutes a day” (129). “As Jesus tells this story you can feel the energy of love building as he shows how the father rejoices ‘with all his heart’ over the boy’s arrival. While the boy is still a long way off the father sees him and his heart warms with compassion (v. 20). He doesn’t hold back and watch to see what the boy looks like; he bursts out the front door and starts running down the road. Now don’t miss the force of this scene. Well-to-do, dignified, aristocratic, aging men don’t run, they walk. They keep their composure. They show that they are on top of their emotions. But not in Jesus’ story about God’s joy over his people. For the last couple of months I’ve had the pleasure of reading through John Piper’s The Pleasures of God (Multnomah, 1991) with some friends from church. The main thrust behind the book is the idea that we don’t truly know someone until we know what makes them happy, and that it’s the same with God. 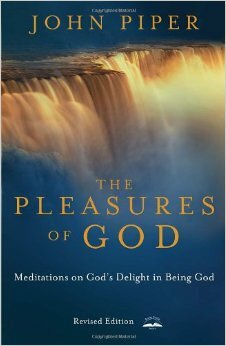 Piper then takes readers on a deeply encouraging and edifying exploration of the pleasures of God, including his pleasure in creation, in doing good to those who hope in him, and in personal obedience and public justice. One of my favorite parts of the book is the inclusion of Clyde Kirby’s “10 resolutions for mental health,” which Kirby, a former English professor at Wheaton College, first gave at a lecture in 1976. These resolutions aren’t so much about mental health, I think, as about developing a child-like sense of wonder and joy at the creation that surrounds us and this life that God has given to us. Are these the kinds of thoughts and activities that could help someone with depression? Absolutely. But ultimately, this is about the kind of joy that anyone can experience given the right balance of self-forgetfulness and God-pleasing awe at the world around us. Below is first, Piper’s reflection on the heart behind these resolutions, and then the resolutions themselves. Enjoy! “One of the tragedies of growing up is that we get used to things. It has its good side of course, since irritations may cease to be irritations. But there is immense loss when we get used to the redness of the rising sun, and the roundness of the moon, and the whiteness of the snow, the wetness of the rain, the blueness of the sky, the buzzing of bumble bees, the stitching of crickets, the invisibility of the wind, the unconscious constancy of hearth and diaphragm, the weirdness of noses and ears, the number of the grains of sand on a thousand beaches, the never-ceasing crash crash crash of countless waves, and ten million kingly-clad flowers flourishing and withering in woods and mountain valleys where no one sees but God” (80). 6. I shall open my eyes and ears. Once every day I shall simply stare at a tree, a flower, a cloud, or a person. I shall not then be concerned at all to ask what they are but simply be glad that they are. I shall joyfully allow them the mystery of what Lewis calls their “divine, magical, terrifying and ecstatic” existence. 8. I shall follow Darwin’s advice and turn frequently to imaginative things such as good literature and good music, preferably, as Lewis suggests, an old book and timeless music. 9. I shall not allow the devilish onrush of this century to usurp all my energies but will instead, as Charles Williams suggested, “fulfill the moment as the moment.” I shall try to live well just now because the only time that exists is now.